We’d love your help. Let us know what’s wrong with this preview of The Blind Man's Garden by Nadeem Aslam. Jeo and Mikal are foster brothers from a small town in Pakistan. Though they were inseparable as children, their adult lives have d The acclaimed author of The Wasted Vigil now gives us a searing, exquisitely written novel set in Pakistan and Afghanistan in the months following 9/11: a story of war, of one family’s losses, and of the simplest, most enduring human impulses. To ask other readers questions about The Blind Man's Garden, please sign up. I felt the book ended right after Mikal saved the soldier and died..There was no need to tell what happened with Naheed and her sister-in-law...It seems to be meant for readers to have a sigh of relief but still.I felt it could have been left unmentioned. What do you think? Kanishk Singh That's exactly what i felt! It should have ended then and there. Those three extra pages did not help. Though they didn't made the book less perfect,…moreThat's exactly what i felt! It should have ended then and there. Those three extra pages did not help. Though they didn't made the book less perfect, just added to momentary confusion. But you understand why I had to do it? I had no choice. I couldn't ask all those intimate questions of a blind person. I had to live it. Very understandable but only a little way into the book, I could not shake off the feeling that something was amiss. Going over the volume another time I discovered it was the message inadvertently embedded in its textuality: the book is not written for me. It is written for a Western audience. Exhibit A: "She looks out of the window, past the low rosewood bough from which a sheep is hung every year to be disembowelled and skinned just minutes from its last concious moments, to mark the Sacrifice of Abraham". It's called Bakra Eid and there is no reason to be so apologetic and over explanatory for it especially since it has no bearing on the plot. Any appearance of vernacular language is meticulously translated and there aren't many to begin with. All characters speak with the same voice which has zero regional influence and some details are inaccurate (12 buttons in one rupee, seriously?). All of this would not have been a problem if the chief claim of the book wasn't that it helps in understanding this complicated country. 'I think first of the subject matter and then the characters and plot which would facilitate in addressing it', Nadeem Aslam claimed at the Lahore Literary Festival. And this is exactly where he faltered. Reading this book felt like I was eavesdropping on a conversation I wasn't a part of. This is a complex book, filled with complex emotions. "Nuanced" doesn't come close to describing its portrayal of fundamentalist Islamist fervour and the various forces and interpretations within Islam that in many ways define it, and also attempt to balance it [ultimately ineffectually? not sure], but in the end, must simply survive it. The same nuance and complexity emerge with respect to the use of torture, the oppression of women, or just about any other issue raised in this novel of post-9/1 This is a complex book, filled with complex emotions. "Nuanced" doesn't come close to describing its portrayal of fundamentalist Islamist fervour and the various forces and interpretations within Islam that in many ways define it, and also attempt to balance it [ultimately ineffectually? not sure], but in the end, must simply survive it. The same nuance and complexity emerge with respect to the use of torture, the oppression of women, or just about any other issue raised in this novel of post-9/11 Pakistan / Afghanistan, seen through the eyes of a constellation of characters who must navigate, often blindly, (and both literally and figuratively), through the inherent conflicts of their own beliefs, relationships, and realities in the world around them. A central conundrum - the prevailing dynamic - is the clash of religions and, more broadly, cultures which both cause the conflicts, and ultimately also provide the only tools to endure, if not resolve, them. This book forced me to confront a lot of my own assumptions, emotions and attitudes - and I'm left holding these thoughts in each of my hands and different parts of my brain, irreconcilable. At the same time, as jo points out in her exceptional review, although there is much that is disquieting and even rage-inducing, there is also the intense beauty of the writing and imagery, and especially, the Mikal character's unswerving goodness and sense of justice. This book is sometimes overwhelming, always challenging, and probably not for everyone. It is a test of tolerance and empathy, in many ways. The beauty of the writing, the power of the imagery, the essential force of goodness that drives (again, literally and figuratively) the action in the character of Mikal, is the reason I've given it five stars. Seeping out from beneath the grammar and syntax of his perfectly polished adopted tongue is the melancholy and ache of Urdu’s vivid images and startling metaphors... Moonlight, fireflies, flowering plants and trees, singing birds, the movement of the stars and the colour of the sky texture the narrative and act as subliminal triggers which create an emotional subtext connecting the reader to the beauty of Islam’s poetic and artistic traditions. light is a dominant theme. the light of stars, of kerosene lamps; the light of the dappled sun and of sun- and moonlight reflected in water; the light of fireflies; often the lack of light, like when power is cut and generators don't work, or when someone goes blind and the light his eyes can still see is more a tease that an aid. this is present in Wasted Vigil too. also: representation, especially the sly representation of pentimento painting, a tool of survival in a world where extremist islamism makes images forbidden. then books, books everywhere, and nature: flowers, plants, smells, tastes; animals. animals have a particular place in his extraordinary book, and here i'll say what makes it so extraordinary: as manjul bajaj so beautifully and accurately says, "the book is Aslam’s prayer for the whole world, his attempt to bathe it in light." but i think that aslam goes even farther than this. i think that in his book he makes peace. he creates it. he imagines it and makes it happen. all of his characters (in this book, unlike in Wasted Vigil they are muslim except for one, the priest of the school where two of our protagonists teach) are peace-loving people who put humanity, decency, and compassion way ahead of their own safety, comfort, and lives. the tremendous injury of the aftermath of the 9/11 attacks -- a whole country attacked for no reason at all, its people decimated, its cities and villages reduced to rubble, fundamentalism and rage stoked with the most powerful bellow of all -- is mourned deeply and shown clearly in the book, but there is no anger: only a huge sorrow. and the protagonists of the book, this motley host of sometimes weird and always beautiful characters put their bodies in the wound and heal it. it's aslam's novel and he can do what he wants with it. so he heals this unhealable wound. he does it mainly through the unbelievably lovely character of mikal, whose love for animals and for peace, whose utter inability to be angry, whose putting peace ahead of desire and self, are poetry unto themselves. to say more is to give away the book, but if you read this extraordinary work of art, pay attention to mikal all through the book and in particular in the second half. pay attention to his carefulness with life -- all life. to his tenderness. to his earnestness. to his incredible love. aslam uses a quote from simone weil at a crucial point in the book: "Love is not consolation, it is light." i am not sure what weil meant when she wrote it; i'm not even sure what it means, in general. but in this book this quote could not be more appropriately placed. There are books that I can breeze through, not thinking much, just allowing myself to be entertained. This is probably the majority of books for me. Within 20 pages, I felt off-kilter. I soon realized The Blind Man's Garden was the OTHER kind of book, the book that demands your full attention and engages you fully. Read.every.word.no.skimming. The kind of book where you don't stop to feed yourself or answer the phone, where you just wander from bed, to couch, to chair...occasionally changing the There are books that I can breeze through, not thinking much, just allowing myself to be entertained. This is probably the majority of books for me. Within 20 pages, I felt off-kilter. I soon realized The Blind Man's Garden was the OTHER kind of book, the book that demands your full attention and engages you fully. Read.every.word.no.skimming. The kind of book where you don't stop to feed yourself or answer the phone, where you just wander from bed, to couch, to chair...occasionally changing the locale of your reading. If I read a book like this every couple of years, I consider myself really lucky. Blind Man's Garden is set in post 9/11 Pakistan and Afghanistan. It's the story of one family and their struggle to survive hardship and loss while maintaining their humanness. If you're a Muslim-hater, this book isn't for you, (unless you're willing to take a look through the eyes of a different culture, someone not like you). That being said, Blind Man's Garden isn't anti-American (or pro-Muslim). It portrays reality. It shows atrocities committed by both sides rooted in fear of the enemy, the challenges of women once used to relative freedom now trying to contend with wearing their jewelry hidden under black robes, husbands afraid for their wives to leave the home, lest they be stopped by the religious police, the fear of angering a neighbor who might tell lies about you to the authorities. I likened it to Nazi Germany with different trappings. It shows that caught up in all the politics, there are everyday people, laughing with their husbands, hugging their children, eating meals together...just people. It's not a political book, but a book about PEOPLE. Having read each of Nadeem Aslam’s previous novels with great enjoyment, I bought this one in hardback almost as soon as it was released. His novel Maps for Lost Lovers – which took Aslam ten years to write – I’ve read twice and it remains one of my favourite modern novels. Aslam’s last novel The Wasted Vigil which is also set in Afghanistan – I enjoyed – but found the message ultimately hopeless, I wondered therefore what this one would be like. Having read Aslam before I knew I wasn’t in for a Having read each of Nadeem Aslam’s previous novels with great enjoyment, I bought this one in hardback almost as soon as it was released. His novel Maps for Lost Lovers – which took Aslam ten years to write – I’ve read twice and it remains one of my favourite modern novels. Aslam’s last novel The Wasted Vigil which is also set in Afghanistan – I enjoyed – but found the message ultimately hopeless, I wondered therefore what this one would be like. Having read Aslam before I knew I wasn’t in for a comfortable ride – it wasn’t, but it is definitely worth it. Nadeem Aslam’s fourth novel is often brutal and sometimes angry, but totally unforgettable. Aslam’s often poetic writing is rich in imagery and deeply poignant. Weaving together the political and social realities of Pakistan and Afghanistan, with the tragic story of a family deeply and irrevocably affected by the war which comes in the wake of 9/11, The Blind Man’s Garden is ultimately, a story of hope and resilience. Jeo and Mikal are foster brothers from a small Pakistani town; together they decide to go to Afghanistan, following the terrorist attacks in the USA, to care for wounded civilians. However there are malign forces at work against the pair, and their good intentions soon put them both into harm’s way. Left behind are Jeo’s wife Nadeem, secretly in love with Mikal, and Rohan, the father who brought them up, slowly going blind, and haunted by the memory of his dead wife. “He walks out into the garden where the first few lines of moonlight are picking out leaves and bowers. He takes a lantern from an alcove. Standing under the silk-cotton tree he raises the lantern into the air, looking up into the great crown. The tallest trees in the garden are ten times the height of a man and even with his arm at full stretch Rohan cannot extend the light beyond the nearest layer of foliage. He is unable to see any of the bird snares – the network of thin steel wires hidden deep inside the canopies, knots that will come alive and tighten just enough to hold a wing or neck in delicate, harmless captivity. Also left behind are Basie, Mikal’s elder brother and Yasmin his wife, Rohan’s daughter. They teach at a local Christian school run by Father Mede – which some Islamic zealots wanting to make a name for themselves, have their eye on. At another local school – Ardent Spirit – the sinister Major Kyra and his saluki hound stalk the rooftop watching the town and mourning the loss of his own brother in Afghanistan. Set against the backdrop of the superstitions and strictures of a small town in Pakistan, and among the wilds of Afghanistan, The Blind Man’s Garden takes the reader on a terrible journey. The war is seen from many perspectives, those left behind, those caught up in a war they don’t believe in, the war lords and the American soldiers, and the women for whom the world is uneven and narrow. Nadeem Aslam tells a story that sometimes makes the reader want to look away; it is a story of terrible events coming out of misunderstanding and suspicion. There are faults on each side, Aslam unflinchingly portrays the Islamic zealot, the war lord, the American soldier and the misguided follower realistically – beliefs fuelled by hysteria and propaganda leading to savage acts of war. I read this book because I'll be on a panel at Singapore Writer's Festival with this prize-winning author. It's another of those fraught narratives about Afghanistan. I don't think I would have finished the book if not for feeling duty bound to do so because of the panel. Like Khaled Hosseini's A Thousand Splendid Suns, Aslam offers us a very well-drawn view of a society and mind-set that many of us wouldn't otherwise get to experience. My problem was that the writing was too good and made me feel I read this book because I'll be on a panel at Singapore Writer's Festival with this prize-winning author. Like Khaled Hosseini's A Thousand Splendid Suns, Aslam offers us a very well-drawn view of a society and mind-set that many of us wouldn't otherwise get to experience. My problem was that the writing was too good and made me feel too intensely the constraints of those living in that society. My head literally felt blinkered by the Blind Man's religious philosophy. As for the constraints the women had to live with, well... No more said. This book highlights what a gulf there is between those of us accustomed to having a liberal Western mindset and those of other persuasions. A particularly telling vignette is the shock and horror experienced by Afghan villagers confronted with a stray American soldier who has the words "Infidel" defiantly tattoed on himself. For me, this was the tiny piece of glass that magnified the reality of our current politics. How some countries send their sons into harms way with no knowledge of the causes they're fighting for and the people they're fighting against, to lose their wars in conflicts no one can win. I was depressed and tired when I finished the book. The Blind Man's Garden is a multi-layered book of great complexity which deals with issues of culture, family and religion in a manner to help the reader understand the delicate nature and intricacy of the web these themes create in our world. I am thrilled to discover Nadeem Aslam, the second Pakistani author whom I have fallen in love with this year. Like Exit West's author Mohsin Hamid Aslam write wonderful prose which must be savored. As Roh The Blind Man's Garden is a multi-layered book of great complexity which deals with issues of culture, family and religion in a manner to help the reader understand the delicate nature and intricacy of the web these themes create in our world. I am thrilled to discover Nadeem Aslam, the second Pakistani author whom I have fallen in love with this year. Like Exit West's author Mohsin Hamid Aslam write wonderful prose which must be savored. As Rohan makes his way through the garden, not long after nightfall, a memory comes to him from his son Jeo’s childhood, a memory that slows him and eventually brings him to a standstill. Ahead of him candles are burning in various places at the house because there is no electricity. Wounds are said to emit light under certain conditions—touch them and the brightness will stay on the hands—and as the candles burn Rohan thinks of each flame as an injury somewhere in his house. And that is where I was hooked. As if in a garden Aslim sprinkles the book with images of butterflies, flowers and birds. Do not be fooled by the beautiful prose, this book packs a powerful punch and contains suspense which will have you on the edge of your seat. The story is set shortly after 9/11 at the beginning of the invasion of Afghanistan. It is told through shifting perspective of a number of complex characters and moves back and forth between Pakistan and Afghanistan. Rohan is the blind man of the book, he is a retired Pakistani teacher who still mourns the death of his wife Sophia many years before. Other characters include his daughter in law, Naheed and foster son Mikal, among others. The door has opened and both of them have entered the future. Jeo sits in the back of the van with Mikal as they are driven through the shadowland of hill and plateau, the use of headlights kept to a minimum so that at times there is no knowing what lies a mere five seconds into the darkness. Later in the night lightning appears overhead and illuminates not only the earth and the clouds but also the place in the mind where the line of fear crosses the thoughts, and the ground glows blue for a few seconds with a crystal immediacy, vistas opening up as in a vision, with black shapes looming in them, shadows perhaps, perhaps creatures who can be fought only with the weapons forged by the spirit, not the flesh, and then as the night deepens the stars come out and wheel overhead, smearing the sky with ancient phosphorescence. A haunting tale of the impact of the American reaction to 9/11 told through the stories of two young Pakistani men who go to Afghanistan with the naive idea of working in a medical centre. They are handed over to the Taliban who plan to use them as new fighters. Their stories are alternated with their families back in their small home town and in the nearby city of Peshawa. To be in this region is dangerously ambiguous with the Taliban, Al Qaeda, warlords, American special forces, Pakistani Secre A haunting tale of the impact of the American reaction to 9/11 told through the stories of two young Pakistani men who go to Afghanistan with the naive idea of working in a medical centre. They are handed over to the Taliban who plan to use them as new fighters. Their stories are alternated with their families back in their small home town and in the nearby city of Peshawa. To be in this region is dangerously ambiguous with the Taliban, Al Qaeda, warlords, American special forces, Pakistani Secret Service and the innocent. Enemies could be anyone and anywhere with many changing sides depending on who has the money. Nothing is simple and no one is safe. Honestly, I kept abandoning this book in favour of others on my Kobo because it was quite difficult to get into. I believe that it was the narrative style in the writing or quite possibly the cookie cutter characters that threw me. I felt that I had to really push myself to see this book through til the end. I would have to say that if the author had taken part 3 of the book and built a storyline about a Pakistani man who is a wanted Taliban fugitive and an injured American Special Forces offic Honestly, I kept abandoning this book in favour of others on my Kobo because it was quite difficult to get into. I believe that it was the narrative style in the writing or quite possibly the cookie cutter characters that threw me. I felt that I had to really push myself to see this book through til the end. I would have to say that if the author had taken part 3 of the book and built a storyline about a Pakistani man who is a wanted Taliban fugitive and an injured American Special Forces officer depending on each other as they travel across Pakistan- I would have bought into the story. Nadeem Aslam’s prose creates an effect very similar to that described as pentimento in painting, where images or elements that have been completely painted over by the artist become visible, revealing an earlier design trapped under the layers of the present work. There is a translucence to the author’s English which reveals an under layer of Urdu. Seeping out from beneath the grammar and syntax of his perfectly polished adopted tongue is the melancholy and ache of Urdu’s vivid images and startl Nadeem Aslam’s prose creates an effect very similar to that described as pentimento in painting, where images or elements that have been completely painted over by the artist become visible, revealing an earlier design trapped under the layers of the present work. There is a translucence to the author’s English which reveals an under layer of Urdu. Seeping out from beneath the grammar and syntax of his perfectly polished adopted tongue is the melancholy and ache of Urdu’s vivid images and startling metaphors: blood, pomegranates and rubies combine to capture the many inflections of pain, hurt, grief and regret. Moonlight, fireflies, flowering plants and trees, singing birds, the movement of the stars and the color of the sky texture the narrative and act as subliminal triggers which create an emotional subtext connecting the reader to the beauty of Islam’s poetic and artistic traditions. Like grass that grows out of abandoned ruins asserts the triumph of life over death, this is a life-affirming tale of love and redemption emerging from the stark landscape of loss. Love is not consolation, it is light. The book is Aslam’s prayer for the whole world, his attempt to bathe it in light. The Blind Man’s Garden is a novel which rewards attentive reading and one in which the reader savours every word. It is the story of a Pakistani family torn apart in the aftermath of 9/11. Foster-brothers Jeo and Mikal hope to make a difference to the plight of Afghan civilians by helping those wounded in the ongoing conflict but their altruistic ambitions are thwarted when they fall into the hands of an Afghan War Lord. Meanwhile, at home in Pakistan, their father Rohan has to deal with Taliban The Blind Man’s Garden is a novel which rewards attentive reading and one in which the reader savours every word. It is the story of a Pakistani family torn apart in the aftermath of 9/11. Foster-brothers Jeo and Mikal hope to make a difference to the plight of Afghan civilians by helping those wounded in the ongoing conflict but their altruistic ambitions are thwarted when they fall into the hands of an Afghan War Lord. Meanwhile, at home in Pakistan, their father Rohan has to deal with Taliban sympathizers keen to join the Jihad whilst the women of the family have ever-dwindling rights in a male-dominated world. Aslam uses elegant, lyrical prose to describe a world which is often brutal and grotesque. His characters are vivid, complex and flawed – there are no saints on either side. Rohan’s garden provides an oasis of calm, respite from the turbulence of the outside world but he also faces an inner struggle. In a society dominated by religious extremism it becomes increasingly difficult to reconcile family and faith and this inevitably creates tension between generations. It seems a nigh impossible task to unite East and West but, in this compelling novel, Aslam succeeds in highlighting what we have in common – humanity, loyalty, love and family ties – the building blocks upon which a more peaceful future might be based. Despite the tragedies which haunt this family, this is fundamentally a story of hope. A very poignant book that travels through the war-torn lands. The book left me wondering about the futility of war- families torn apart by war and strife. The story unfolds through the travels of Mikal-the despair and hope of a man who wants to do no harm. Overall, a very good read- a bit slow at times, but beautifully written. I have been on hold for this author's more recent work, got tired of waiting and tried this one to get a taste of the writing reviewers seems to admire. It is partly lyrical with mystical elements but is also halted in some sequences. It could be that I was trying to turn a blind eye to the more difficult passages exhibiting suffering in Afghanistan, a possible cause of my reaction to some phrasings at times. I know I should keep his more recent book on my Hold list, but I may have to change my I have been on hold for this author's more recent work, got tired of waiting and tried this one to get a taste of the writing reviewers seems to admire. It is partly lyrical with mystical elements but is also halted in some sequences. It could be that I was trying to turn a blind eye to the more difficult passages exhibiting suffering in Afghanistan, a possible cause of my reaction to some phrasings at times. I know I should keep his more recent book on my Hold list, but I may have to change my mind with a limit of 5 books. There is a reverence within this book juxtaposed with brutality. Some very real global situations can be hard to read from the comfort of one's armchair. Fosse stato uno dei soliti romanzi di guerra post-11 settembre, il ruolo di protagonista sarebbe stato assegnato a David Town, l’ufficiale del governo Usa che conduce l’interrogatorio dei sospetti, oppure all’altro americano, l’ostaggio di cui non sapremo mai il nome. Invece il protagonista non è Town che ben presto esce di scena, bensì proprio il giovane pakistano lacero, mutilato e reticente che l’ufficiale si trova di fronte in catene, perché questo è un romanzo particolare che sfugge ai dettami del genere, così come è particolare il suo autore, 51enne anglo-pakistano trasferitosi dal natìo Pakistan a 14 anni, studioso di biochimica e autore di soli quattro romanzi, tre dei quali tradotti in italiano, il bellissimo “Mappe per amanti smarriti”, il meno riuscito “La veglia inutile” e questo. “Il giardino del cieco” (che è il titolo originale, non quello incongruo e pretenzioso che l’edizione italiana ha attribuito…) è un’opera molto affascinante che, proseguendo l’analisi della sua essenza ibrida e, per ciò stesso, molto originale, mescola in un contesto pakistano, “terra straziata e dolente”, elementi di azione che sembrano quasi tratti dal western: il fuggiasco, il prigioniero, l’assedio, il tradimento, il ritorno, il sogno di un futuro pacifico e familiare, simboleggiato dai fiori del giardino richiamato nel titolo, quasi un’utopia nell’inferno in cui ognuno si trova a vivere, anzi a sopravvivere. Ma il ritmo e lo stile della narrazione sono prettamente orientali con lunghe fasi contemplative e la presenza costante del sentimento religioso in tutti i personaggi, anche i giovani cresciuti con un’educazione “comunista”. Su tutto ciò incombe il conflitto talebani/americani reso più complesso (e più verosimile) dalla presenza dei “Signori della guerra” e dei governi locali, di dubbia affidabilità e schierati ora con l’una ora con l’altra parte, secondo la convenienza. Si esce dalla lettura di questo notevole romanzo con la percezione di un caos dominante, sul quale Aslam evita di prendere una netta posizione (non è un romanzo “militante”) attribuendone l’univoca responsabilità all’intervento americano o alla pressione dell’integralismo islamico: tutti sono vittime e carnefici, in definitiva marionette di una scena che è stato e resta uno dei principali incubi della nostra epoca. Che speranza possono mai avere con queste premesse, l’amore di Mikal e Naheed, la presenza di una scuola cristiana fra le moschee, l’amicizia fra Jeo e Mikal? Forse la risposta è in quei due bambini che nel finale giocano “riempiendo di grida l’aria limpida rinfrescata dalla pioggia”. Ma quei bambini sono già orfani. You know those lazy Sunday afternoons when you're slumped in front of your television wondering if you should take a quick nap or wash the car, and boom...a bomb has just gone off in Pakistan, injuring and killing a lot of Muslims, innocent bystanders, women and children included. Yet you feel nothing, probably because you've seen this before, again and again, and you've also seen enough footage of what seems like crazed Muslims, Pakistani men, women and children, burning American and British fla You know those lazy Sunday afternoons when you're slumped in front of your television wondering if you should take a quick nap or wash the car, and boom...a bomb has just gone off in Pakistan, injuring and killing a lot of Muslims, innocent bystanders, women and children included. Yet you feel nothing, probably because you've seen this before, again and again, and you've also seen enough footage of what seems like crazed Muslims, Pakistani men, women and children, burning American and British flags, stomping on them while chanting "Allahu Akbar". The western media has told one side of the story. Nadeem Aslam now tells the other, through The Blind Man's Garden. If you flipped the channel without a second thought, read this book. To many Asians like me, this book does not change my perception of Muslims just because a few bad apples decided to give Islam a bad name. I have enough Muslim friends, family members and business associates from all over the world (Pakistan included) to know they are (surprise, surprise) exactly like me - moderate, liberal, educated and here's the thing - they don't hate America or Israel, Jews or whites. They are...well, how shall I put it....human beings, with families, girlfriends, bank accounts and 2 pairs of jeans. Nadeem Aslam's book is a must read. There's no better way to tell the story of the ordinary Pakistani and Afghan who are as much a victim of the terror the so-called jihadists continue to wage in the region, as anyone else. The protagonist, Mikal, brings the story full circle when he, quite by 'accident', meets the man who has a bullet with his name on it. To my relief, in 'The Blind Man's Garden', Aslam has succeeded in toning down his vivid imagination and focusing more on the story he plans to tell. (unlike what he did with the 'Maps for Lost Lovers'). In this novel set in the immediate days after the US invasion of Afghanistan in 2001, Mikal accompanies his foster brother Jeo to Afghanistan from Pakistan on a humanitarian mission. Things immediately go awry with Jeo ending up murdered and Mikal being captured. After a series of exchanges between warlords, Mikal ends up in the interrogation chamber of the Americans only to be eventually freed. This freeing of an innocent suspect also ends up with a twist - Mikal ends up inadvertently murdering a couple of US soldiers and ends up a fugitive - this time with little chance for escape. Back home, the novel dwells on the lives of Mikal's foster father, Jeo's widowed wife Naheed (who also turns out to be Mikal's original love interest), Mikal's brother Basie, Basie's wife and others. Tekisi mieli lukea tämä heti uudestaan. Ei siksi, että se oli maagisen hyvä, vaan siksi että en ole ihan varma luinko tämän todella huonosti vai oliko tämä todella huono. Sisään siihen en ainakaan missään vaiheessa päässyt, juoni oli todella keksityn ja päälleliimatun oloinen, henkilöhahmot todella yksipuolisia ja etenkin naishahmot jopa ärsyttävän huonoja. No, oma tämä on, joten jos joskus tuntuu, että sille voisi antaa toisen mahdollisuuden, on se ainakin saatavilla. Alternately lyrical and brutal, this is a powerful and visceral story of life in modern day Pakistan and Afghanistan. The central love story is contrasted with accounts of the reality of war and of life inside extremist organisations. This does not always make for pleasant reading, but it is poetic in places and very moving in others. Rohan, while gradually loses his sight of the physical world around him, he begins to see and reflects on his past. His wife from the past is described as vividly as much Rohan loves her. Jeo and Mikal, the blood-brothers, torn in their longing for Naheed, their conflicts both internal and exterior form the imagery of the unfulfilled, distorted, dystopia swamping them in Pakistan and Afghanistan. All this while, the man of bird snare catchers and death keep showing at the gate of Rohan’s present Rohan, while gradually loses his sight of the physical world around him, he begins to see and reflects on his past. His wife from the past is described as vividly as much Rohan loves her. Jeo and Mikal, the blood-brothers, torn in their longing for Naheed, their conflicts both internal and exterior form the imagery of the unfulfilled, distorted, dystopia swamping them in Pakistan and Afghanistan. All this while, the man of bird snare catchers and death keep showing at the gate of Rohan’s present garden – a tormented but beautifully bloomed past. And when the sinful man dragging concatenated chains of people’s sins takes a pause to talk about life, you’ll halt and sip his most tasteful words. The clashes of polarities of archaic and modern or rather humane belief systems are terrorizing. Amidst such backdrop where hardship and Islam zealotry entail a widow forbidden to visit her husband’s graveyard, the pain is surpassed by numbness and love transcends death, distance, violence and even hope. Even before all the characters are woven into the lyrical tale of love and loss, it is the poetic writing that imparts the whole reading experience as watching a musical. When you read a Nadeem Aslam novel, you mull over it. You take in his words and breathe what he has to say. You are aware of the political undertones in his books. At times, you also may not like what you read. You might also detest some parts. You will yell in happiness when something good happens to one of his characters. You want to keep the book aside and you will not be able to, because that is the power of his books. You will ignore everything else and read on, because Aslam has a story to When you read a Nadeem Aslam novel, you mull over it. You take in his words and breathe what he has to say. You are aware of the political undertones in his books. At times, you also may not like what you read. You might also detest some parts. You will yell in happiness when something good happens to one of his characters. You want to keep the book aside and you will not be able to, because that is the power of his books. You will ignore everything else and read on, because Aslam has a story to tell and his characters will talk to you. They will make you believe and sometimes make you cry and live as well. This is possibly the most beautiful book I have read. I was hesitant and annoyed as I began, until I realized it was simply a reaction to the unwonted emotion it was provoking within me. Tangent: I believe the author, Nadeem Aslam, totally knows how to traverse between two worlds and woo British ladies at various and exponential, promotional cocktail hours - whereby he is an under-the-radar guest of honor, sincerely weaving his way into their naive pants like a water moccasin. He seems sumptuous, This is possibly the most beautiful book I have read. I was hesitant and annoyed as I began, until I realized it was simply a reaction to the unwonted emotion it was provoking within me. Tangent: I believe the author, Nadeem Aslam, totally knows how to traverse between two worlds and woo British ladies at various and exponential, promotional cocktail hours - whereby he is an under-the-radar guest of honor, sincerely weaving his way into their naive pants like a water moccasin. He seems sumptuous, yet willfully ignorant of his own seductiveness; attempting to elicit a mien of pure intent. Perhaps his desire is motivated by love in the moment, but he hedonistically ignores its real consequences. Back to the review...I cried four times while reading this book. At least 3 out of 4 of the times had to do with love persisting through the tragic inevitability of death; beauty in raw pain. The book made me examine my own personal definition of art: anything that elicits a cathartic response from its audience, consumer, or creator. Objectively, many critics analyze a work of art for its sophistication of construction; the infrastructure of gentility; the technical craft of a wordsmith. Patience and effort in chaos imbue color into cracked lips. There is a dichotomy in privilege and repression; the master is beholden to the captor. Basically, art is complicated, and perhaps the critic can never be objective. In reading this book I realized peace is power, vulnerability is growth; the author's opinion of the world is simply his emotion, which is frustratingly universal, inconclusive and soaked up like a sponge. In this book I have realized that I am learning, and not everything that I have learned is useful to everyone. The truth is penetrating and frustrating; raw and unyielding; life is synergy through destruction. Through this book, I am ironically reminded that we will always learn while fully present to one another; we will always be catalyzed by standing as witness to the universe in another's eyes; exhalation and inhalation between two souls, than we ever will in solitary contemplation. This was great. It is set in Afghanistan and Pakistan during the months following 9/11. The story begins when Jeo and Mikhal leave Pakistan to join in the war in Afghanistan, one to help with the wounded, the other to fight. They leave behind members of their family who are unaware of their reasons for leaving until after they are gone. Almost from the beginning things go wrong for the young men, and at home problems begin to arise for the rest of the family. The book is very well constructed, fa This was great. It is set in Afghanistan and Pakistan during the months following 9/11. The story begins when Jeo and Mikhal leave Pakistan to join in the war in Afghanistan, one to help with the wounded, the other to fight. They leave behind members of their family who are unaware of their reasons for leaving until after they are gone. Almost from the beginning things go wrong for the young men, and at home problems begin to arise for the rest of the family. The book is very well constructed, fast paced where it needs to be, moving throughout, and not afraid to show the brutality of the war from all sides. It does not preach, but does show how ordinary people are caught up in the conflict, how they have a lack of control over their lives, even when they think they are in control, and the results are pretty devastating. this is actually the fourth Nadeem Aslam novel that i have read and i liked it. it is about two foster brothers who belong to a small remote town in pakistan and this is based after 9/11. they are Joe and Mikal. they they decide to go to Afghanistan not to support the Taliban or any thing else but to just help and take care of the people who are injured and have to suffer a lot due to the war,destruction and all the bad things that happen in war. the details given about Afghanistan are just lovely. t this is actually the fourth Nadeem Aslam novel that i have read and i liked it. they than come across American army. it is a long read though. 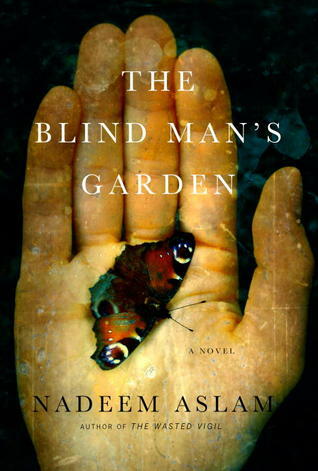 the title of this book is "the blind mans garden"
but after reading this book i have come to know that the novel is not all about the blind man at all but instead the blind man known as Rohan is just mentioned in the last pages!. Aslam was born in Pakistan in 1966 and moved to Britain at age 14. His family left Pakistan to escape President Zia's regime. His novel Maps for Lost Lovers, winner of the Kuriyama Prize, took him more than a decade to complete. Aslam has stated that the first chapter alone took five years to complete, and that the following story in the book took seven months to complete before rejecting it. At th Aslam was born in Pakistan in 1966 and moved to Britain at age 14. His family left Pakistan to escape President Zia's regime. His novel Maps for Lost Lovers, winner of the Kuriyama Prize, took him more than a decade to complete. Aslam has stated that the first chapter alone took five years to complete, and that the following story in the book took seven months to complete before rejecting it. At the end, he kept only one sentence of the seventy pages written. Aslam's latest novel, The Wasted Vigil, was published by Alfred A. Knopf in September, 2008. It is set in Afghanistan. He traveled to Afghanistan during the writing of the book; but had never visited the country before writing the first draft. On 11th February 2011, it was short-listed for the Warwick Prize For Writing. His writings have been compared to those by Chinua Achebe, Chimamanda Ngozi Adichie and Kiran Desai and received an Encore in 2005. He writes his drafts in longhand and prefers extreme isolation when working.